Pruning: Improve your plant’s health by having it’s crown thinned, lifted or reduced. You will significantly improve the quantity of sunlight that gets to your property, too. Removal or felling: Safely cut down trees that annoy you, or have such that are damaged by storm/affected by disease felled. Mind that you might need a permission from your local council for some woody species to be removed. 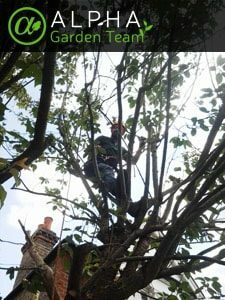 Ivy removal: Professional tree surgeons also have experience in ivy removal. Their professional equipment and expertise help them reach even the highest crawled plants. Large bush removal: Cut down or completely uproot unkempt shrubs that compete with your garden plants. The arborists will shape or fell trees in line with all UK safety regulations. First, you need to call us and ask for a quote. We usually give quotes over the phone, based on photos of your tree. If the images are not good, though, you will have to wait for the final quote until the arborists get to your property and inspect it. On the day of your appointment, a team of two or more qualified tree surgeons will arrive and inspect the woody plant that needs to be tweaked. Once they’re done with the survey, the experts will hear out your individual requests and quote you a final price, based on the tree’s dimensions and the desired result. The professionals will then prune all dead or infected leaves, buds, and branches. 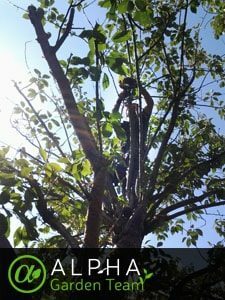 If a complete felling or removal service is requested instead, the team will use efficient tools and safety ropes to cut the tree clean and carefully as lowest to the ground as possible. For a little bit extra, the specialists can also collect and dispose of all green waste for you as soon as the service is done. Please note: Some types of trees are under protection by the UK law and you may need a permission from your local council before altering the plant in any way. The tree surgeons in Bristol are available for any given day of the week, bank holidays. Just make sure to give us a call on 01172 420001, fill in the empty fields in our request a quote form. You can always head over to the reviews page and take a look at what others have to say about our work. Our knowledgeable advisers are available around the clock and will readily answer your questions, help you make a booking, or provide you with free, no-strings-attached price quotes.